Hi, I’m interested in Lenovo G500 Laptop, Intel® Celeron ™ 1005M processor, 4GB, 500GB, Intel® HD Graphics. Please contact me. Thanks! 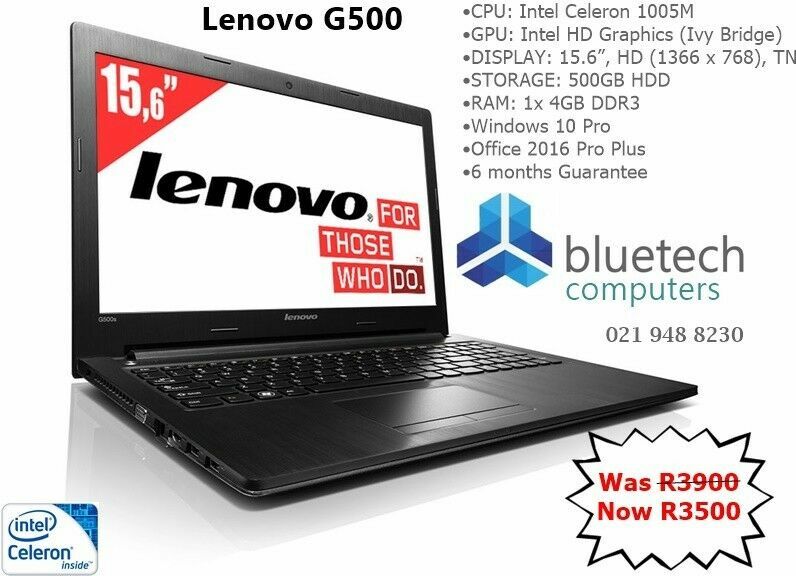 The versatile and affordable Lenovo G500 laptop PC combines a solid look and feel with the latest all-round features, and performance that will surpass your everyday needs.. The 15.6" LED backlit HD display (1366 x 768) delivers bright, crisp visuals in 16:9 widescreen on the G500. Move data between the G500 and other devices quickly with USB 3.0. It's up to 10 times faster than previous USB technologies. The G500's 1M webcam and microphone will help you enjoy web conferences or online video chats like you're really there. With OneKey® Rescue System, recovering from viruses or other technical difficulties is a snap. The Lenovo G500 laptop also makes it easy to back up your system and scan for and kill viruses. Unlike other business notebooks, the Lenovo E51 doesn't compromise on resolution with its optional HD (1366 x 768) display. Keep more windows open at the same time, watch crisper & clearer PowerPoint presentations, or simply kick back at the end of the day and enjoy a movie in stunning hi-res. With **up to 5 hours' battery life between charges, the E51 business notebook is an ideal companion for those on the go. Lenovo Energy Management protects the long-term durability of the battery and uses advanced energy-saving technology to increase time spent between charges. laptop`s original boxes got damaged with transport, You will only get the laptop and charger. The laptop`s original boxes got damaged with transport, You will only get the laptop and charger. Unfortunately the machines all have 2 small scratches on the top cover.